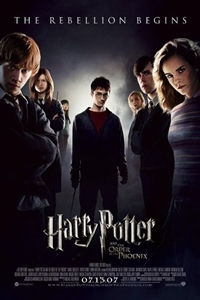 As the fifth year at Hogwarts begins, most of the wizardry world is having a hard time believing Voldemort (Ralph Fiennes) has returned, further propagated by the Ministry of Magic, who refuses to recognize anything evil is brewing and blames all the hullabaloo on Harry (Daniel Radcliffe) and Dumbledore (Michael Gambon). The Ministry even interferes with Hogwarts business by making Ministry employee Dolores Umbridge (Imelda Staunton) the new Defense Against the Dark Arts professor, whose outwardly sweet demeanor hides a sadistic streak a mile wide. She thinks the children should only learn about the Dark Arts "theoretically" and tortures all those who disagree. But the Voldemort threat is a reality, and Dumbledore has re-formed the Order of the Phoenix, a group of witches and wizards that prepares to battle the Dark Lord. Harry is unfortunately being kept in the dark, for his protection, of course, even as his connection to Voldemort grows stronger, and he's royally peeved at being ignored. Urged on by Hermione (Emma Watson) and Ron (Rupert Grint), he forms his own order of Hogwarts students called Dumbledore's Army to teach them what defenses against the Dark Arts he has already learned. Oh, yeah, Harry also shares his first kiss but make no bones about it—love is the furthest thing on Harry's mind when the crap hits the fan. War is imminent. Everyone steps up their game in Order of the Phoenix. Radcliffe, Watson and Grint have shed their adolescent whininess and aw-shucks goofiness to give their characters the greatest depth so far. They are forced to grow up pretty quickly in Order, with little time for any playfulness, and the three actors handle the seriousness with aplomb. Of course, both Radcliffe and Grint have already ventured out of the Potter world—Radcliffe shed more than just adolescence on stage in a production of Equus, while Grint lost his virginity in the indie Driving Lessons--and their extra experience shows in Order. Also good are Matthew Lewis as the usually clumsy Neville Longbottom, who shows his mettle in more ways than one, and newcomer Evanna Lynch as the slightly off-kilter Luna Lovegood, who proves to be a loyal member of Dumbledore's Army. But the kids have to keep up with the talented adult cast, especially Oscar-nominated Staunton (Vera Drake) as Umbridge. The veteran actress' interpretation of one of J.K. Rowling's nastiest characters so far in the Potter lore is spot-on, down to the pink wool suits and irritating twitter "ahem" she uses when she wants your undivided attention. Helena Bonham Carter also makes an impression, however over the top it is, as the evil Voldemort follower Bellatrix Lestrange. Does she ever want to look pretty onscreen? Then there's the laundry list of Brits whose time onscreen may be short but is nonetheless memorable, including Alan Rickman as the sneering Prof. Snape; Gambon as the wise but flawed Dumbledore; Gary Oldman as the kindly Sirius Black, Harry's only real family; and of course, Fiennes as He-Who-Must-Not-Be-Named. His late-in-the-game appearance once again throws you for a loop. It stands to reason that at five movies in, moviegoers would have a favorite Harry Potter flick by now. Those who love those Triwizard Tournament special effects might feel The Goblet of Fire was the best; or Prisoner of Azkaban for its time-bending action. Yet, The Order of the Phoenix may be the one movie that speaks directly to the fans of the books. Without as much wide-eyed wonderment or wizardry flash, the story is still chockfull of compelling details that are absolutely pivotal to the continuing Harry Potter saga. Screenwriter Michael Goldenberg (Peter Pan) and director David Yates (HBO's The Girl in the Café) manage to wade through this volume of information and cut successfully to the chase with great effect. Yates, who has signed on to do the sixth movie, Harry Potter and the Half-Blood Prince, even shows an affinity for action in the final, dramatic confrontation between good witches and wizards and bad ones. But overall, Order of the Phoenix may leave audiences not as well-versed in the novels a little itchy for some good old-fashioned wand-waving and Disney special effects. Thing is, it's just going to keep getting darker and darker for Harry and his crew. The days of happy, fun playtime are over. Hollywood.com rated this film 3 stars.